The entire manufacturing process in a modern plant is now controlled through a microprocessor based programmable logic control system to maintain uniform quality of cement and a high rate of production. The entire operation of the plant is controlled centrally in a single control room and the plant employs minimum of manpower. The modern plants have also taken adequate care to prevent the environmental pollution and dust nuisance to its surrounding areas. The cement mills have electro-static precipitators (ESP) installed to check the dust emissions. The bag filters and glass bag houses are located at various locations to prevent dust emission and to ensure healthy and hazard-free atmosphere. In this process, the raw materials are first reduced in size of about 25mm in crushers. A current of dry air is then passed over these dried materials. These materials are then pulverized into fine powder in ball mills and tube mills. All these operations are done separately for each raw material and they are stored in hoppers. They are then mixed in correct proportions and made ready for the feed of rotary kiln. This finely ground powder of raw materials is known as the raw mix and it is stored in storage tank. 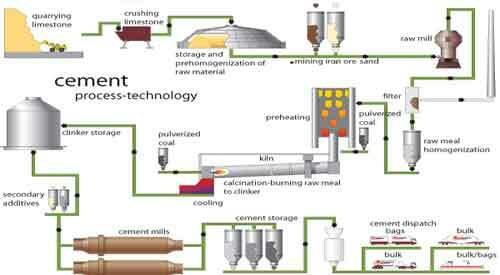 Competition: At present, several dry process cement plants are vying with each other. The cement consumers in general and the practicing civil engineers in particular are greatly benefited by such competition. Power: The blending of dry powders has now perfected and the wet process, which required much higher power consumption can be replaced with confidence. Quality of cement: It is found that the quality of the production no longer depended on the skilled operators and workmen because temperature control and proportioning can be done automatically through a centralized control room. Technology: There has been several advances in instrumentation, computerization and quality control. Boulders of limestone upto 1.2m size are transported in huge dumpers upto 300kN capacity and dumped into the hopper of the crusher. The hammer mill crushers of single stage are now used for crushing. The crushed limestone now of 75mm size is moved from crusher by a series of conveyors for stacking. The stacker helps in spreading the crushed materials in horizontal layers and the reclaimer restricts the variation of calcium carbonate in crushed limestone to less than 1% thereby minimizing quality variation in the materials. The argillaceous or clay materials found in the quarry are also dumped into the crusher and stacked along with the limestone. The crushed materials are checked for calcium carbonate, lime, alumina, ferrous oxide and silica contents. Any component found short is added separately. The additive material and crushed limestone are conveyed to the storage hoppers. The raw materials are fed to the raw mill by means of a conveyor and proportioned by use of weigh feeders which are adjusted as per the chemical analysis done on the raw materials taken from the hoppers time to time. The materials are ground to the desired fineness in the raw mill. The fine powder which emerges as a result of the grinding in the raw mill is blown upwards, collected in cyclones and fed to the giant sized continuous blending and storage silo by use of aeropole. The material is dropped merely by gravity from the blending to the storage silo thereby conserving power. The material is then once again pumped using an aeropole into the preheater with temperature increased from 60°C to 850°C by blowing hot gas at temperature of 1000°C. The maerial from the bottom of the preheater is fed to the rotary kiln. In modern technology of dry process, the coal brought from the coal fields is pulverized in vertical coal mill and it is stored in silo. It is pumped with required quantity of air through the burners. The preheated raw materials roll down the kiln and get heated in such an extent that the carbon dioxide is driven off with combustion gases. The material is then heated to temperature of nearly 1400°C to 1500°C when it gets fused together. The fused product is known as the clinkers or raw cement. The size of clinkers varies from 3mm to 20mm and they are very hot when they come out of burning zone of kiln. The clinker temperature at the outlet of kiln is nearly 1000°C. A rotary kiln of small size is provided to cool down the hot clinkers. It is laid in opposite direction and the cooled clinkers having temperature at about 95°C are collected in containers of suitable sizes. The clinkers as obtained from the rotary kiln are finely ground in ball mills and tube mills. During grinding, a small quantity, about 3 to 4 percent, of gypsum is added. The gypsum controls the initial setting time of cement. If gypsum is not added, the cement would set as soon as water is added. The gypsum acts as a retarder and it delays the setting action of cement. It thus permits cement to be mixed with the aggregates and to be placed in position. The grinding if clinkers in modern plants is carried out in the cement mill which contains chromium steel balls of various sizes. These balls roll within the mill and grind the mixture which is collected in a hopper and taken in the bucket elevator for storage in silos. The cement from silos is fed to the packer machines. Most of the modern plants have electric packing plant having provision to account for the weights of empty bags of different types and to ensure a 50kg net weight of cement bag within ± 200g limit. Each bag of cement contains 50kg or 500N or about 0.035m3 of cement. These bags are automatically discharged from the packer to the conveyor belts to different loading area. They are carefully stored in a dry place.